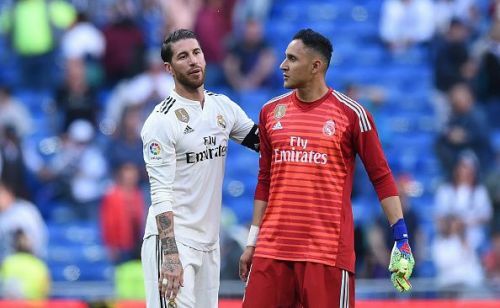 Real Madrid goalkeeper, Keylor Navas, came out and criticized former coach Santiago Solari, stating that Solari would have never provided him with enough chances, no matter how hard he tried. Since the arrival of Thibaut Courtois from Chelsea last summer, Keylor Navas was the second choice keeper for Real Madrid. The Costa Rican goalkeeper was only reserved for Copa Del Rey matches under Julen Lopetegui and Santiago Solari, making just three starts in the La Liga before Zinedine Zidane arrived. It goes without saying that Los Blancos were not able to fulfill their expectations regarding the current 2018/19 season as they are set to end their season without any major silverware. Navas joined Real Madrid in 2014 after his World Cup heroics. In the first stint of Zinedine Zidane, Keylor Navas played a major role as Los Blancos lifted three consecutive Champions League in three years among other notable accolades. The 32-year-old made just his fourth start of the La Liga this campaign and kept a clean sheet when Los Blancos faced Celta Vigo in Zidane's first match of his 2nd stint with Los Blancos. The goalkeeper renewed his contract this season to extend his stay till mid-2021 at the Santiago Bernabeu. The Costa Rican goalkeeper criticized former boss Solari, stating that the Argentine coach was not able to provide him with enough chances, no matter what he did. "I did have the feeling that whatever I did in practice, I wasn't going to play," Navas said. Navas also revealed that he wants to play more games at Los Blancos in the coming years. "I have a contract. My enthusiasm has always been at Real Madrid and I am focused on what is coming," . Real Madrid will return to action after the international break as they host Huesca next in the La Liga.